My middle daughter turned 12 this week and celebrated her last elementary school birthday party. Since they were the last ones they had to memorable. So of course we hit up Pinterest for some cupcake ideas. Honestly what did we ever do before Pinterest? How did we get ideas? 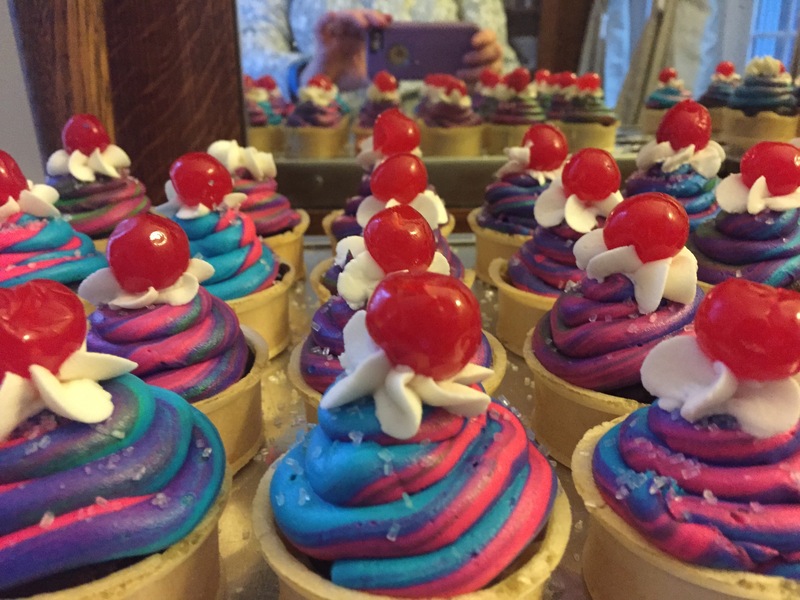 She texted me the pictures she liked and we decided to merge a couple of ideas and came up with our tye-dye ice cream cone cupcakes. Preheat the oven to 325. Wrap the ice cream cone bottom in aluminum foil and place in a cupcake tin. The aluminum foil keep the cone standing straight in the oven. Open up the cherries and strain them and place them on a paper towel. Give them time to dry out because if they are wet they will run and ruin the icing. Prepare the cake mix as directed. Fill each cone 2/3 of the way with cake mix. Each cake mix yields a slightly different amount but you will get 28-30 cupcakes. Which helps when sending cupcakes into school because there are usually more than 20 kids, the amount of cupcakes one box of mix typically makes. Bake the cupcakes for approximately 30 minutes. They are done when you can insert a toothpick in the center and it comes out clean or it pops back up when you press it in the center. Prepare the buttercream icing. This recipe is a double recipe because I always need more icing I only make double batches anymore. Cut up 2 sticks of butter and combine with one stick of crisco in an electric food mixer. The standup mixers are the best as I have burned out one or two handle held mixers making icing. Add 1lb (4 cups of sugar) Be careful and add the sugar slowly and mix slowly because the powder can get pretty messy. It can look the scene in Goodfellas when Henry tells Sandy to use the dishwasher to clean the kitchen. I trick I found is wetting a paper towel and wrap it around the mixer and it works really well to keep the powder contained. Once all the sugar is blended add 2 tablespoons of milk. Blend until you have a creamy but stiff consistency. After the icing is prepared split into five bowls. 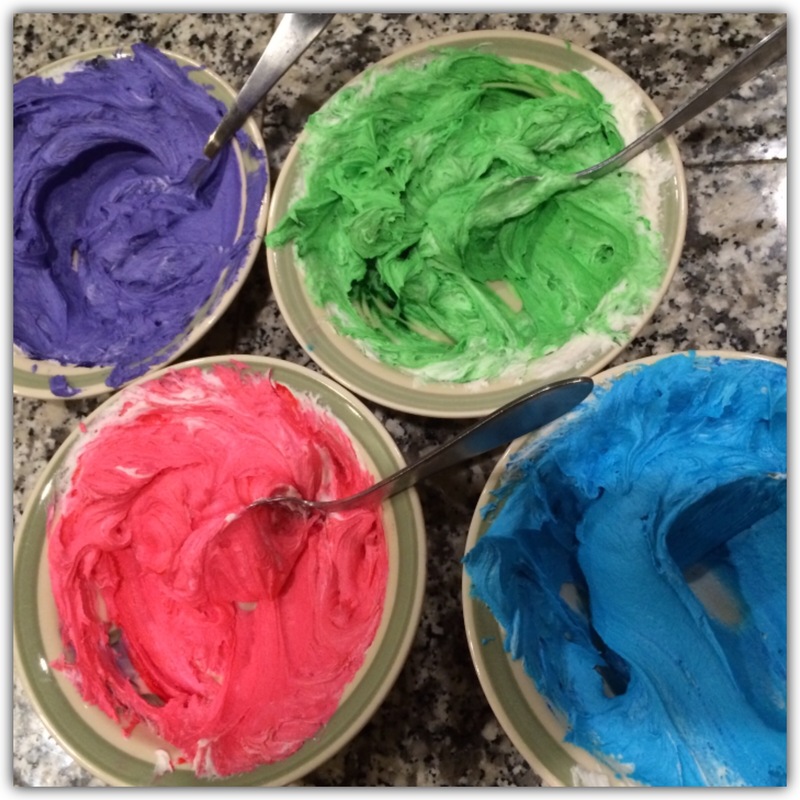 Using you Wilton Icing dye each of the bowls green, blue, pink, purple and leave one white. Then take an icing bag and cut off the tip. Place an icing coupler of the bag. Use a wilton round tip. 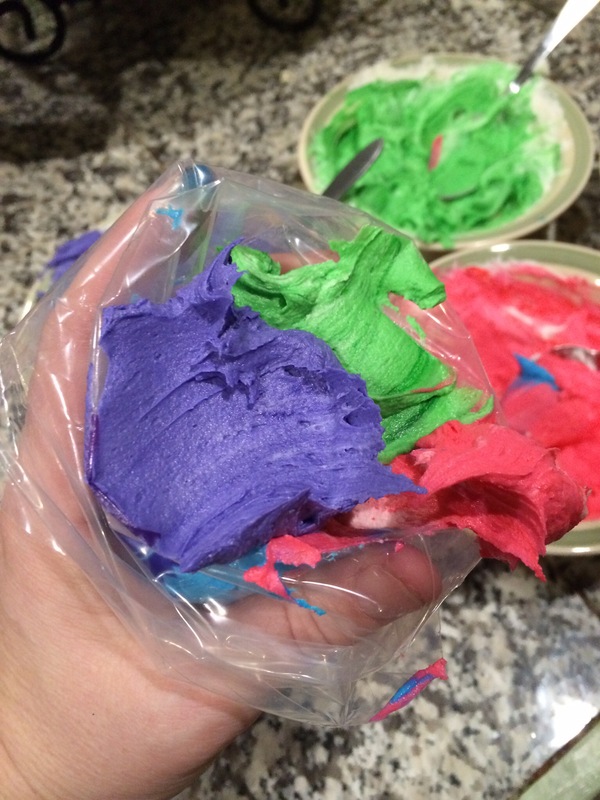 Fold down the icing bag and put a spoonful of each color in the bag. The colors will mix but try to keep them separate and put each spoonful next to one another around the perimeter of the bag and not on top of each other. The colors start to mix a little so I recommend changing bags part way through. Once all the cones are decorated with the tye-dye icing sprinkle with Wilton white crystal sugar. Cut off the end of another decorating bag and put in cupcake tip 1M. The cupcake tips are too large and you do not need a coupler. Place one star on top of each cupcake to look like whipped cream. Again make sure to stop pressure before you pull away. Place a cherry on top. 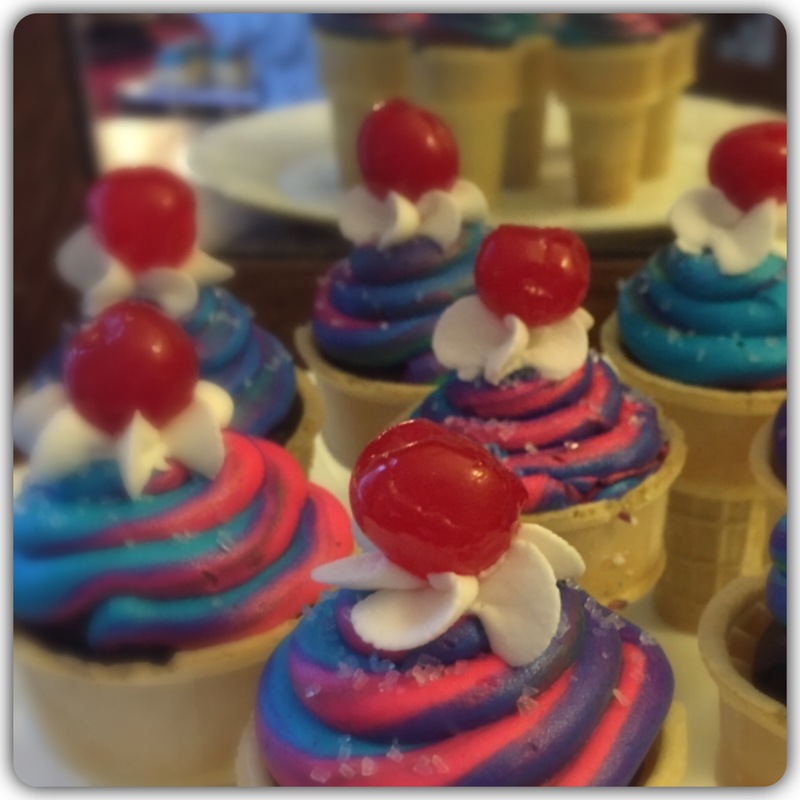 Cupcakes in a cone are a birthday family favorite at our house. Have you ever made them? What are birthday family favorite cupcakes at your house? I would love to hear about it. This entry was posted in Birthday Day Parties, Cakes & Cupcakes, Food & Snacks, Recipes and tagged Birthday cupcakes, buttercream icing, cake, cake decorating, Chocolate, Chocolate cake, Cupcake, dessert, Duncan Hines, Ice cream, ice cream cones, icing, tye-dye cupcakes, Wilton. Bookmark the permalink. They are! Using different colors we can make a boy theme like camouflage. Using green, brown, and white. Perfect for little baby boys. These are very creative and look so delicious! Thank you for sharing! Thanks. There are so many good cupcake in a cone recipes. I like them because they are easy to eat.